Keep your legs super-warm in comfortable Heavyweight Fleece. The micro-fleece interior feels soft against the skin. Plus, it's moisture-wicking to help keep you dry. And the gusseted crotch lets your crouch and climb in comfort. 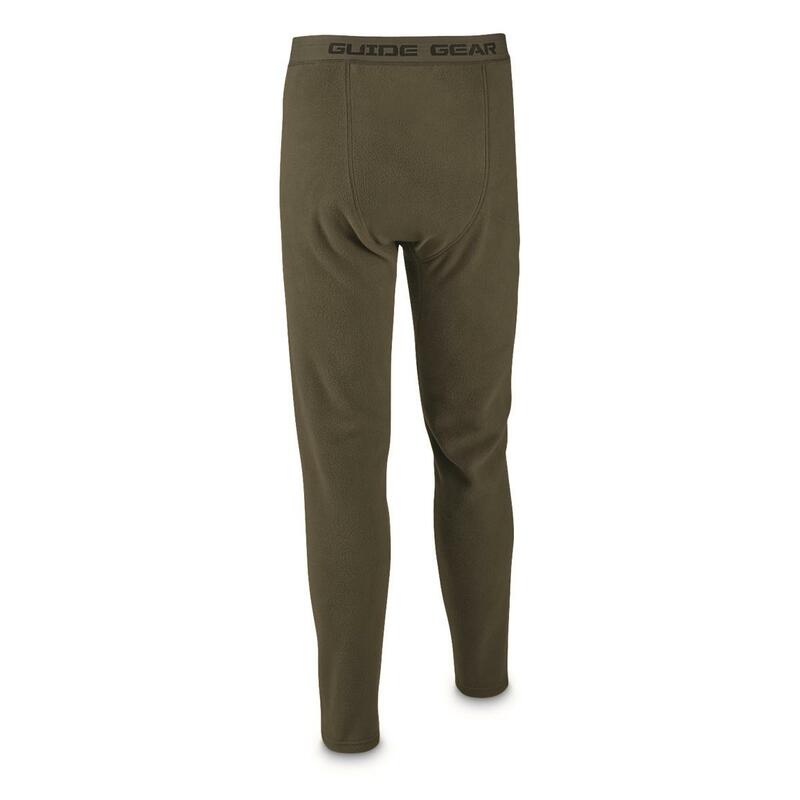 With these Heavyweight Base Layer Bottoms, frigid temps won't keep you inside. 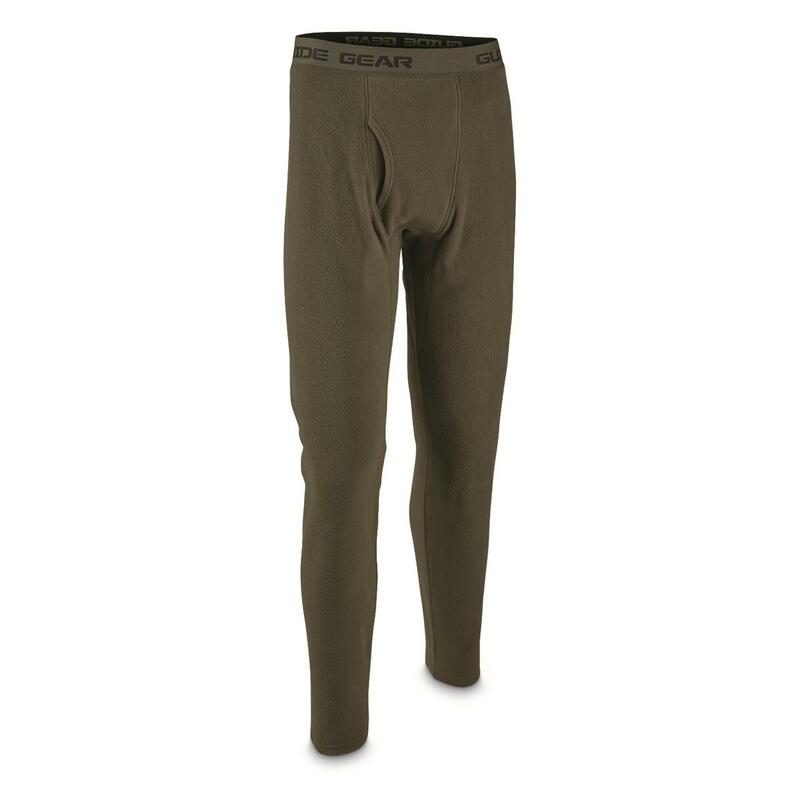 When it's really cold, keep really warm in these Heavyweight Fleece Base Layer Bottoms. Guide Gear Mens Heavyweight Fleece Base Layer Bottoms is rated 4.6 out of 5 by 7. Rated 4 out of 5 by Wolf from Soft and warm Nice soft and warm,was on duty for a 6 hours @28 degrees in the snow. These kept me warm. I’m hoping they hold up. So far they work well. As mentioned before no elastic at the ankles although the waistband is nice a nice width. Rated 5 out of 5 by Steve in AR from Great Value Very warm. Looks like they will hold up well. Rated 5 out of 5 by CJ2019 from Soft and super comfortable. These bottoms are perfect: soft, warm, & comfortable. I have now purchased 5 pairs. They run a bit on the small side (I bought a size Medium) but aren't overly small. Length is average; they were bought for a 5' 5' tall 155# man and fit him well. They held up well to washing (inside out) and drying. They have a close to the body fit, but aren't too tight. Rated 5 out of 5 by Arlo1560 from Soft & Warm! These are great for just about any outdoor activity in cold weather. I have never own a pair that is as warm as these. I certainly was not disappointed. The size is good, no elastic around the ankles. They are so comfortable you want to lounge in them. Rated 3 out of 5 by mikeElikesit from TOO SMALL Decent quality. Bottoms are too small. Tops seem true to size. I would order one size larger on bottoms. Rated 5 out of 5 by CPTaMerica from Compare to ECWCS Level 3 Civilian version of military issue. Nothing else needs to be said! Rated 5 out of 5 by Whit from Much warmer than traditional thermals.